OWINGS MILLS, Md. (AP) — The effective play of rookie Lamar Jackson as a starting quarterback has left Baltimore Ravens coach John Harbaugh with a decision to make if veteran Joe Flacco returns this week from a right hip injury. Once Flacco returns, the clock begins ticking for Harbaugh to decide between the pocket passer he’s guided since 2008, or the rookie who’s been slashing and darting all over the field for an offense that’s surpassed 400 yards in each of the last two weeks. 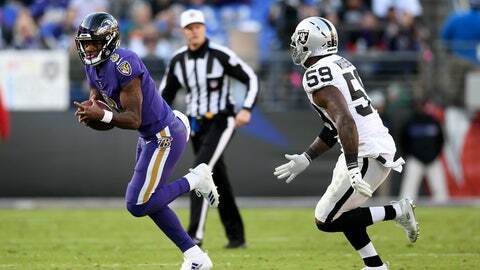 With an assist from rookie running back Gus Edwards, the Jackson-led Ravens ran for 265 yards against Cincinnati and 242 against Oakland. Prior to that, Baltimore’s season high for yards rushing was 123. Flacco’s has the edge in experience and is the better passer. Jackson is a threat to run at any time, a skill that drives opposing defenses crazy. “When you can establish the inside run, the perimeter offense, all the bells and whistles with Jackson, they’re very hard to defend,” Raiders coach Jon Gruden said. Should Harbaugh reach a decision before the Ravens face the Falcons (4-7), don’t expect him to publicly announce it.